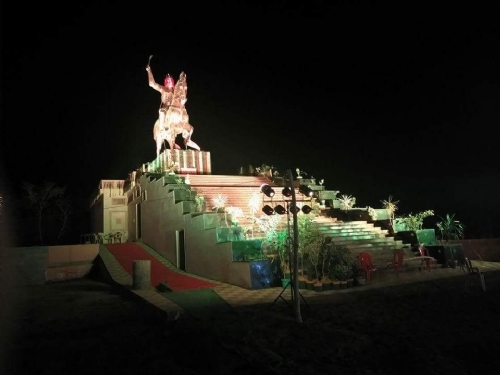 Maharaja Chhatrasal Memorial Research Institute"s three-years of hard work and dedication became more important and meaningful with the unveiling of 52-feet high statue of Lord Bondelkhand Kesari Maharaj Chhatrasal. 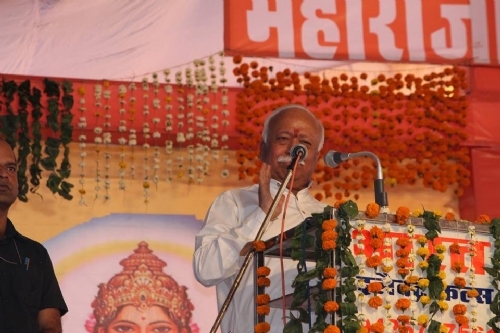 It was inaugurated by the RSS chief, Dr. Mohan ji Bhagwat. Sarsanghchalak ji said that the great men did not fight for establishing their dominion and superiority but actually fight against the enemies to safeguard the culture and dharma of the nation. He believed that as long as the dharma and culture are preserved well, the society is safe. Sarasanghchalak ji, after unveiling the statue established in Chhatrasal Shaurya Peeth with Vedic Mantra, said that Maharaja Chhatrasal ventured out on the path of truth and dharma with selfless interest and today our culture is still prevalent, alive and remembered as a result of that. On this day we all should take an oath to follow the path that he led. For many centuries and millennia, Bharat has made important contributions in the field of spiritual prowess. He said that Lord Shri Ram ’s , life and his teachings are endless and eternal. From time to time, he has reincarnated in various forms, and has given purpose and direction to our society and country. This effort is being made in order to keep the ideals of Maharaja Chhatrasal alive in this land of Bundelkhand. He also said that truth always prevailed and he only lived for the propagation of the truth. He also believed that asceticism and austerity had to be followed. That is why we are remembering Chhatrasal and celebrating his glorious life story. However, we too must attempt to be like Chhatrasal. He said that if people stayed true their ideals, ethics and morals, practiced their dharma and did not go awry or stray away from the path of enlightenment, then they too would be able to accomplish all that he had. Maharaja Chhatrasal did not do any of this for his own benefit. Not only Chhatrasal, but even Maharana Pratap, Shivaji etc. had done all this for the conservation and propagation of dharma because only if dharma and culture is preserved, the world will continue to progress. Therefore, in order to keep this society safe, even if we incorporate a fraction of his teachings in our lives, the welfare of the region will be accomplished. He always practiced what he preached. He was a man without any kind of ego, selfishness, fear and compulsion. His only mission in life was to protect the culture, dharma, society and the country at large. Dr. Mohan ji Bhagwatsaid that the society does not progress because of any particular leader, government or party, they are only instrumental in the process. But instead the progress happens because of the thought process of its people. Therefore the entire society needs to get united and think in the same direction. In spite of difference in language, caste, creed, and sect, everyone should work towards the same mission. Only then will the country be made equal and unexploited. He said that this huge statue has been unveiled today, but we need to look beyond the statue and remember the beautiful life that he led. The millions of people who have gathered here should take a vow that we will implement his teachings in our lives and the hidden beauty of life behind the idol will be accepted by all of us. Only if the life behind this huge statue is understood, the dignity of the Bundelkhand will increase further. It is very essential to get inspired by the great patriots. If you want to strengthen Bundelkhand then you will have to become Chhatrasal. Dr. Mohan ji Bhagwat said that foreign powers have extended history only on paper, but today this huge statue points to the fact that those who give their lives for the nation are always remembered. Although the British may have referred to Maharaja Chhatrasal with other names including a robber, but the bravery of the warrior has never been removed from the mind of the society. Today it has been proven that those who devote their lives for the nation are never going to be missed out in history. They will always create their own history. 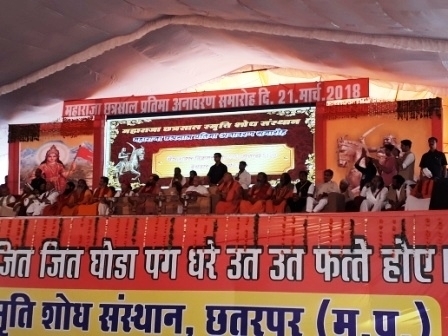 Referring to the construction of Shri R am Temple in Ayodhya, he said that Ram Ji"s temple is to be built, and this is not a desire but a resolution and we will fulfill this resolution. The dialogue regarding the construction of Ram temple is going on since 1986. But the difficulty is that those who have to build a Ram temple, they will have to make themselves like Ram. There is no reason to doubt the construction of the temple. The right time to build the temple will be when all the circumstances are favorable.